Omega Fire Ministry founder, Apostle Suleiman, addresses the issue of tithe and OAP, Daddy Freeze's attacks during used a sermon on Sunday, November 12, 2017. 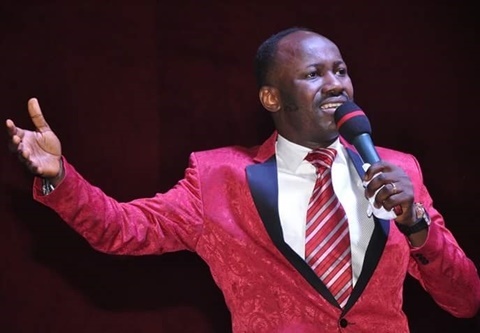 Apostle Suleiman wants Daddy Freeze to know that social media followership is different from real life followership. So, he needs to stop overrating himself. The issue of tithing in the church and its moral legitimacy is still raging and it doesn’t seem to be going down any time soon. When On-air Personality, Freeze called out the Omega Fire Ministries founder, we knew this was not going to be ignored and the multi-millionaire preacher has fired back. But first, where did Suleiman go wrong to have deserved Freeze’s nasty post? He simply cautioned Freeze and other internet activists against attacking Pastor Enoch Adeboye on the topic of tithe. After Freeze maintained his readiness for a battle with all the pastors, the fierce preacher used a sermon on Sunday, November 12, 2017, to address the issue. “To talk is cheap, to post things on the internet is cheap. “If you’re against pastors, or you fault what pastors do, no problem, start a church, run it for ten years and do it the way it should be done. Then we will listen to you. On the tithe controversy itself he said: “The issue of tithe is because of the way certain young new generation preachers are in a hurry to compete with minister who have been there for years, not knowing that 90% of these ministers you see who are very blessed have private businesses. “The tithe I pay every Sunday is more than the tithe all of you pay for two Sundays...and I pay tithe to ministries and ministers. It’s a personal revelation. “Only the spirit of God can reveal things to you. If I talk to you in this church about anything, go back and ask God. “Anyone who wants to raise up a people must understand the place of the spirit (of God). You do not attack, you correct nicely.